In the small village of Castel Villa in Southern Burgundy, not far from the medieval town of Cluny, where the towers of the great Abbey reached to the sky, lived the heroes and heroines of this story. Claudette was born into a peasant family who struggled to survive and were often starving when their small harvest failed. Her life and that of her family changed dramatically when she went to work at the Chateau, to a tumultuous life she could not have imagined. In the Middle Ages, girls and women had to struggle to make their place. Labelled by the Church as the ‘first sinners’ and compared by misogynous clergy to the devil, they were at an enormous disadvantage. Jean Lombard was born and grew up in Dublin, Ireland, where she met John Lombard, a journalist, when they were both working in Guinness's Brewery. She migrated to Australia in 1968 and married John in Melbourne, the same year. They have travelled widely, spending some years in Singapore and Russia, where John was a Foreign Correspondent for the ABC. Jean researched her first book 'An Irish Woman in Czarist Russia' while living in the former Soviet Union. Jean and John bought a ruined farmhouse in a small village in Southern Burgundy, in 1989, and later renovated it. This has been their home for the past 26 European summers. As a lover of history, Jean was inspired by life in the village to write this story. 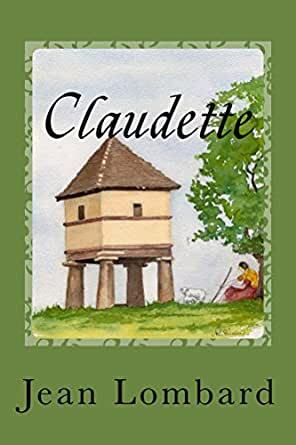 Claudette has been translated into French by Rachel Guyet, M.Lang, PhD. Really enjoyed this book. The characters came alive and the descriptions of the times were very effective. Well done to Jean! I enjoyed the book very much. I love history and was able to part of their every day lives. I really enjoyed this read, the style was unusual but worked well as the tale progressed. Being a fan of this period, I felt it captured the times and the way life was led, while perhaps reflecting that there is nothing new in the vagaries of life. A journey through through a violent time, with pleasantly little gore. It reads like fact despite the unusual twists of the tale. For people who love history and France it is a very nice book to read. Well written, nice story, sometimes a bit like a fairy-tall but with a lot of info how life used to be in the middle-ages in Bourgondy, I loved reading it! I found this book to be a highly enjoyable read. It was obviously very thoroughly researched and presented a vivid picture of the living conditions and social mores of the time. The author’s knowledge of, and affection for, the area is evident throughout the book. I especially liked the relationship between the two women and found myself wanting to return to the book to see what happened to these very strong characters. Rosemary Sinclair's illustrations are an attractive addition.